A native of Ottumwa, IA, Dr. Mohan earned her Bachelor of Science in agricultural biochemistry at Iowa State University and completed her Doctorate of Dental Surgery at the University of Iowa. She enjoys attending continuing education courses that include ways that patients can improve their quality of life and have a healthy, beautiful mouth and smile. Most recently, Dr. Steffany Mohan has completed courses for Invisalign®, implants, and other areas of dentistry that can help patients to look and feel better and have improved function for chewing and smiling. Announcer: Hello, and thank you for listening to The Founder’s Corner podcast hosted by Ajay Prasad. Join Ajay as he sits down with business owners from around the world to discuss their business struggles. As an entrepreneur and proud owner of many seven-figure web-based businesses, Ajay has dedicated himself to helping businesses of all shapes and sizes grow. If you would like to reach out to Ajay, fill out the form on our site. Enjoy the show. Ajay: Hello, and welcome to The Founder’s Corner podcast. 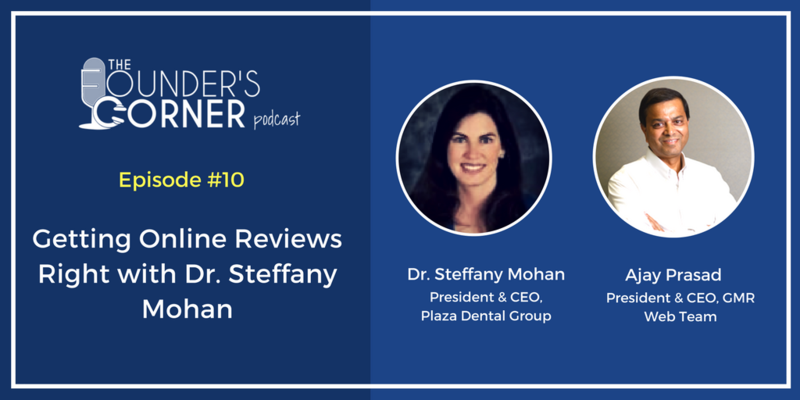 Today, we have a special guest, Dr. Steffany Mohan, owner of Plaza Dental Group in Des Moines, Iowa. How are you today, Steffany? Dr. Mohan: I’m going great. Thank you so much. Ajay: Wonderful. Steffany, tell us something about yourself, your business, and your involvement in the dental industry. Dr. Mohan: Right. I’ve been a practicing dentist for 21 years since 1996 – a little over that, I guess, now. I’ve been educator and I have, obviously, been in private practice for that whole 21 years, and now we are expanding. We have three practices and really just experiencing what dentistry has to offer today and working hard to see some growth and some expansion. Ajay: Wonderful. I understand that you also help other dentists in their practices and you help them build their practice? Dr. Mohan: Mm-hmm. Right. Yup. Yeah, I’ve actually been an educator both on the business side and on the clinical side, which has been really interesting and really fun. A lot of times, we need almost more help on the business and marketing side than we need on the clinical side – clinical dentistry is always our focus and, generally our passion, but sometimes the business side and the marketing side can make more of a difference in our lifestyle and our practices. Ajay: Yeah, definitely. No, with my experience of marketing with probably over a dozen dental practices, I can see that, just because you are really good at it, unless people know about that, it doesn’t help with the practice. Dr. Mohan: Right. Well, it is extra effort. If you want to pay attention to both, it’s definitely extra time, and extra energy, and extra effort. Ajay: I know exactly what you’re saying and that’s one of the things that I see lacking. Many of my clients, not in terms of understanding or really doing their job – so all of them are great dentists and they keep up with whatever the latest technology is and everything – but, when it comes to marketing and doing that extra work to make sure that’s where I see a lot of issues, anyway, so I understand what you’re saying. Ajay: Good, Steffany. I know it’s all about you, so let’s get to your questions – the questions you may have for me. Dr. Mohan: Okay. What do you see as the biggest challenges for marketing dental practices today? Ajay: I’ve always said there are three pillars for any healthcare marketing and especially since you are basically on your own since there are very few dentists who are employees. The biggest challenge I’m seeing in the marketing is what we just talked about. Most of the dentists don’t understand, I think, the need of marketing. The marketing has changed – how consumers are searching for a dentist has changed in the last decade or so – but the change is really moving really fast in the last couple years. And I see many of the dental practices still using the same old marketing processes that they used to do, maybe, 15 years back, which was working. And so, the biggest challenge that I am seeing is the dental practices moving from, I would say, the traditional dental marketing processes like direct mail, even TV, radio, and all, and getting into the digital marketing area because that is where all the prospective patients have moved. The search for dentists, actually, there are interesting stats. Did you know “dentist” is the third most searched term on the internet? Ajay: You’re getting into billions and billions of searches, but I have seen many dental practices have not adjusted to it, so that is a really big challenge for the dental industry from the traditional marketing process that they have been using to the new digital era. And, even in digital, as all of us have probably started doing, everything is moving to the smart phones, right? Ajay: How do you market your dental practice so that someone who is searching for you on the smartphone can get all that information and find you? That, I am seeing, is the biggest challenge that industry is facing as a whole – that whole transition from traditional to digital. Dr. Mohan: Right. I completely agree with you. That’s something that we see a lot. Ajay: Yeah. Since you have three practices, I’m sure that you are seeing exactly the trend, the changes that are happening. Dr. Mohan: Well, and, in addition, digital is very confusing for most people and there are so many possibilities. There are so many things that you could be doing that people… I think that it’s hard to make a choice so that’s one of the ways that you really shine because you know exactly what you’re doing. Ajay: And the funny thing is that, digital, a lot of dentists, if you ask them, “What is digital marketing?” they would not even know what it is. Ajay: That is a challenge for marketers like us, is explaining what it is because typical healthcare provider – so I’m not even saying dentists, I’m including physicians – they don’t know the difference between digital marketing and marketing so that’s the whole new challenge. And, again, it’s because they’re not adjusted to the whole new trend that is happening. Ajay: Good, Steffany. Any other questions? Dr. Mohan: Yeah, so I think we all know that online reputation is becoming a bigger and bigger thing. How critical is it, really? Ajay: The online reputation, first thing, I’ll give you some interesting stats from a company that does massive research. Some of the very interesting stats is over 90 percent of the people use online information – and mostly reviews – as part of their decision process, right, so that’s interesting. Ajay: 70 percent of the people, they believe as much in online reviews as they believe, for example, a recommendation from their friends and relatives, which becomes very big. In a sense, even if a friend or relative recommends a business, they go and they will check the reviews on the internet. Ajay: But the most relevant for your industry is that over 30 percent – 31 percent was the exact number – of the prospective patients rely solely on reviews when they are selecting a provider. Right! Ajay: It has become a really critical piece of marketing and we are seeing the same thing and in dental, of course, you have even a bigger challenge. I live in southern California so I don’t know how it is in Des Moines, but I can tell you that, here, it seems like there’s a dentist on every block. Dr. Mohan: Wow. I think you’re right – I think there might be. Ajay: It is becoming a really important issue and, unfortunately, that is one of the things where I don’t see a lot of dentists or even the healthcare providers paying attention to. And the other thing that is very critical when you’re talking about online reviews is that just because you are doing a very good job doesn’t mean that your online reviews are going to be very good. As a matter of fact, we did research of our clients – and we took, in this case, I’m telling you, for information, like medical healthcare providers – and so, when they started with us, and are doing the marketing so one of the things that we always do is we always track the patient satisfaction. Right? Ajay: We look at how was the online reviews and then we know the patient satisfaction because, the patient satisfaction number, you cannot fake it since it’s the patient that you are asking and it’s a survey. And it’s a complete mismatch. Ajay: You would think that a physician with a very high patient satisfaction will also have a very high review scores, but that’s not true. And it is so much so that, right now, we are working on, basically, a white paper to explain this and, hopefully, everyone will start to understand how things work. Ajay: So, No. 1, it is very important because, like I said, people are searching for it, and, No. 2, unfortunately, if you are not proactively managing it, it will not be a true reflection of who you are so the score will always be lower than it should be, unless you are proactively managing it. Dr. Mohan: Interesting. Right. Or, like a business like mine where I’m one of them, but I have eight dentists so I can’t control all of that so I need to work hard on it, I think, because, of course, you’ve taught me that it’s important but I don’t think I would have thought too much of it if I hadn’t known. Ajay: And that is exactly what is happening because, see, when you have eight dentists and suppose one of them is not very good with a patient, when a patient comes in and walks out unhappy, they’re unhappy with the whole business – they’re unhappy with Plaza Dental, not with that particular dentist. Ajay: And this is what is very true in every healthcare practice. In fact, one of our clients, because we started monitoring patient satisfaction by the physician for them, recently let go of one of the physicians because they said that they’re just pulling down the whole customer perception and image of the practice. Ajay: So the monitoring, obviously, is a big thing but, again, like I said, unless you monitor it, you will not know where the problem is and, if you are not solving the problem then, the reviews, it’s not going to be very good in there. Everything is intertwined, right, so if you’re really tracking your patient satisfaction to make sure that it is working and then you are also then making sure that your review is a true reflection of patient satisfaction instead of a few unhappy people. And, every business, I have someone have clients – I’m sure that you have… You can't please everyone. Ajay: But, if 95 percent of your patients are really happy but if the Yelp score is 1.0, that’s not a true reflection of what is happening in the practice. Dr. Mohan: Right. Well, it really is an artificial… Well, the internet, in general, is an artificial scorecard. Ajay: You are very correct. It is artificial so it’s really up to you to bring it to as much real as possible. Dr. Mohan: Right. And fair. Ajay: Because I have clients in every industry and this is just across the board – it’s not just for healthcare industry. Ajay: We had one client who came in because he said, “Well, we do get phone calls from your service, which is digital marketing, but we are not getting any business.” I just pulled his reviews and I said, “Okay, so this is what happens: I find you, I contact you, you say, “Okay,” we have meeting, and you give me a proposal. Then what is the next thing I’m going to do? I’m going to find out about you,” so I just went and I typed their business name and things popped up. I said, “Now, you tell me, would you buy from this business?” because it was so bad – and this is a landscaping business – so I said, “When the reviews are so bad, would you do it?” He had never checked it, which is very true of most of the businesses and including most of the dentists. He had never checked his reviews, so when he sees that, he’s like, “I know this guy. He was bad. And this guy…” Because there was only a handful – there were only four or five complaints, anyway – and then he said, “But, this year, we have done 200 clients where we have done their landscaping and hardscaping,” so I’m like, “Yes, but you did the job, they paid you for it, and that was the end of it. So, unless you are managing and unless you are making sure that, people, are they happy and if they’re happy, they are writing reviews, this is what will happen. And so, he got on the plan and I basically told him that the first thing he should do is start calling all his clients and say, “How was the experience and do you mind sharing that on the net?” And, literally, in a couple of months – because when you have one or two people pulling you down and there are only two reviews, then they’re 1.0 and 1.0 so your average is 1.00 – but even five, six more come in and they give you five stars and, all of a sudden, your average starts to look very respectable. And now his business is doing fine. Dr. Mohan: But it is what it is. Ajay: Yeah, it is what it is so you really have to proactively address it. Dr. Mohan: Right. I agree. That’s wonderful. Thank you. Okay, so the next question that I have is what advice would you give to local dentists? Ajay: Sure. I’m assuming you are saying what I tell local dentists to make sure that they increase their number of patients so they can improve their practice. Dr. Mohan: Right. Well, that’s what everybody wants. They want to make sure that they’re still a healthy business. Ajay: Exactly. I will tell you, just so you know my philosophy and we talked about it on the website, so we always say that there are three pillars of a thriving dental practice – or it should be for any business, but definitely for dental practices so this is very true. The first couple, we already talked about, right? We already talked about the patient satisfaction because I always start with the thing that’s, “Listen, if your patients are not happy, unfortunately, unless you address that for whatever reason, unless you are to treat your patient – they come in and they are really happy with you – no matter what you do, you’re not going to have a thriving business.” Right? Because, especially in the dental practice, the lifetime value of every new patient is very high, right, so you need to have a really good patient satisfaction number – that is given – and the only way you do that is you have to monitor it on a regular basis and make sure that you keep on improving the patient satisfaction. It will never be 100 percent – we suggest a scale of 0 to 10 because it has become an industry standard but, yes, you’ll never get 10 from every patient – but you want to get closest to 10 if possible. That is first thing that I say that there has to be a process in place within the organization to make sure that you are monitoring patient satisfaction – if someone is unhappy, you know that you have an unhappy patient, you have a process to reach out to them and try to address so that they convert. In fact, we always know that the unhappy people, if you take care of them, they become your biggest advocate. That is the first thing that I say that you have to have a process in place – to me, that’s the foundation of any business. Right? That is your foundation. The second thing we already talked about is the online reviews, which is really important because you have to have stellar online reviews. If 30 percent of your prospective patients that check in are already making a decision solely on reviews, then you cannot escape it. But, an even bigger thing is that, 90 percent of your prospective patients are saying that this plays a role in it so, again, giving the whole same example of Orange County where, on each block looks like there is a dentist so I have a choice and, if that is even one of the factors – others could be the convenience and all that – it can still sway a lot of people away from you if your online reviews are not good. And then, again, like I said, online reviews just need to reflect your reality or business and what we have seen is that is not the fact. We have seen that, when we monitor patient satisfaction versus where the online reviews are at the starting point, especially for the practices that don’t proactively manage online reviews, we see a big gap. We always see that, as I’ve already shared, so you have to, again, have a process in place for an ongoing improvement of online reviews. And the third, I would say, is the pillar that I always say is the third pillar, is you need to have a very robust online presence and so let me explain what I mean. Like I already said, people have switched and they are no longer keeping magnets – frankly, on my refrigerator in my home, even if you send me a magnet, it won’t stick there. I don’t know what kind of material it comes on. Dr. Mohan: Right. That’s funny. Ajay: And then, of course, if you send a postcard, then it is really looking at needle in the haystack because, unless I need it immediately, I’m not going to keep the postcard and, you know why? Because now, if I need a dentist or I have a toothache and I’m trying to find a solution, I just have to pull my smart phone and I have all the information about it. Right? Ajay: Because of that, you need to have a really robust online presence so the first thing is, of course, when someone is searching for a dentist around their area – “Dentist Near Me” or dentist in the city that they are in – you need to get found so that becomes very important. And then people are not generally talking about dentists any more and they may even have a very specific solution so they may say, “Orthodontics,” or they may say, “Cosmetic Dentists,” or they may even say, “Dental Implant Surgeons.” And these things, it’s not like a mystery, so there is a lot of data available so that you know what the specific searches for your specialty are and then, once you know the searches, then you want to make sure that you are found. Now, again, getting found is one thing of the robust presence – you need to get found – then, of course, reviews are part of the robust online presences, right, because, when people find you, guess what they’re going to do? They’re going to say, “What’s a review of this particular dentist?” And then, also, now they expect you to be more, I would say, social so you should have a good social media presence. Now, the new generation of patients, especially the millennials, I will tell you that they like to deal with the people who, in their mind, are the influencers. What it means is that you have the blogs written up that they are finding about you so, when they find your name, they see the blogs, they see things about your practice, they see your social media profile on LinkedIn, are you doing something? The more presence you have on the internet the better so that’s what I mean by robust internet presence. Now, there’s no benchmark, per se, that, “Oh, if you have five mentions, you are good.” We have many clients where, if you type their name, the first five pages will be about them so it just, through the newer, I would say younger, generation, it just gives them a lot of confidence. And this requirement is, again, it’s becoming more and more so it looks like, every year, they are getting pickier and pickier. It’s like, “Oh, this doctor is on the cutting edge,” or whatever so it’s really having a robust presence. And, by the way, part of the robust internet presence also – and this is something that we started advising from next year to all of our clients – is to also have some kind of your own community because what you don’t want to do is have your patient, for example, join a community of competitors. And all I mean by community is a place where they can interact about their issue. The only reason we are not proactively doing it is because there is so much issue there so that we are, right now, trying to figure out so that there’s a very specific instruction of how can you participate and how can you create the community of your patients and their friends and relatives that they recommend so it is your internet community that is growing and they’re interacting with you with their questions, issues, where you can share them. I know that all the good dental practices, when it comes the time for Halloween, you are always sending instructions, right, like, “Don’t eat candies,” “Make sure that you donate or destroy,” whatever. Anything like that or maybe there’s a new thing on dental that you want to share, having your own community so that the people feel like they are valued and that you care about them. Again, there needs to be far more activity on the internet – that’s what I mean by a robust internet presence – and what is robust, Steffany, it’s a moving target so, obviously, when the new things come in, now Twitter has become a big deal – thanks to our president – so there is a whole lot of new emphasis, especially for the influencers, on Twitter because they want their people to follow. And you have tons of millennials who get, it seems like, their news from Twitter in the sense that Twitter will send them whatever, some kind of text or reminder, on the smartphone and it’s like, “Oh, this is what happened.” There are new things so it is a moving target. There’s no other way than to keep up with it and make sure that you are doing it. Dr. Mohan: No, that’s a great answer. Yeah. Ajay: Yeah, so start on your patient satisfaction, start an online reputation, and robust online presence. I think that is almost must-have nowadays to have a thriving practice. Dr. Mohan: Yeah, to stay viable as a business, but it’s so easy in areas – or easier – in areas like mine to stay ahead of the curve so, as long as you’re not in a very saturated area, how smart is that to try and always be ahead of the curve and have that online presence? Ajay: Exactly. And, now, if you have started to build the community of your followers, per se – when I’m saying community, so your followers – who are looking up to you for advice, for whatever related to it then, even if a new business starts, then you have started to create a moat around your business, which is, of course… I’m a big admirer of Warren Buffett – I think most of the people are – and he always says that, “I invest in a business that has a moat around it so that it’s much harder for a competitor to break in,” and that’s what can happen so, in a funny way, effectively using digital marketing, you can start to create a moat around your business so that it will be harder for someone to break and pull your clients away from you. Good. Steffany, if you don’t have any other questions… Do you have any other questions? Dr. Mohan: No, this was amazing. Thank you so much. Ajay: Thank you. Now, we are just going to post it and, if someone wants to contact you for anything – if there was a specific question – are you okay with them contacting you? Dr. Mohan: Yeah, of course. Yeah, my email is fairly simple – it’s my first name and my last name – but it’s Steff, S-T-E-F-F M-O-H-A-N, at gmail.com. Ajay: Okay. Good. And what I will do is I will have your exact email on our notes so that no one can be unsure about that. Dr. Mohan: Sure. Yeah, people try and find me with different spellings, but it doesn’t work for some reason. Ajay: Yeah, so we’ll just make sure that it is there if someone wants to contact you. And then thank you very much for your time and we had a very interesting discussion today. Dr. Mohan: Yeah, thank you so much. Ajay: And I think that all my healthcare, actually, the followers that listen to this podcast should take this thing seriously, our discussion. I thought this was a really good discussion. Dr. Mohan: I agree. Yeah, I agree. Thank you so much. Announcer:Thank you for listening to this episode of “The Founder’s Corner” podcast. If you enjoyed this episode, be sure to follow and rate us on iTunes, Stitcher, and SoundCloud. If you are listening through one of these programs, visit our main page at www.gmrwebteam.com/thefounderscorner.